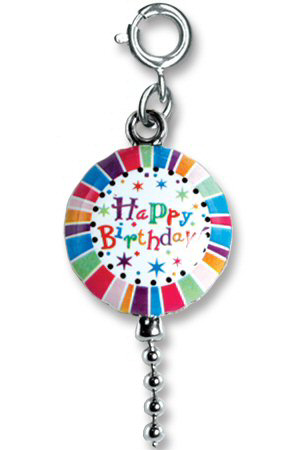 Celebrate your special happy birthday with this fun and colorful CHARM IT! Birthday Balloon charm. With colorful stripes, stars, and letters spelling out Happy Birthday!, this fun Birthday Balloon charm features 3-dimensional balloon and a wiggly silver-ball string, a combination sure to delight Birthday Girls of all ages. With a simple snap of a clasp, girls can personalize their CHARM IT! jewelry with this CHARM IT! Birthday Balloon charm. This colorful CHARM IT! Party Time! charm has shiny gold-toned letters over a hot pink confetti covered heart. My Birthday Wish personalized book shows kids that with all the possible wishes, it's better being yourself than wishing to be somebody else.